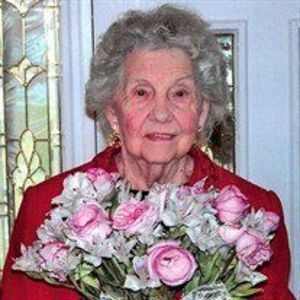 Martha "Marlene" Ruth Sherrill, 97, of Summerville, wife of the late Rev. Clayton C. Sherrill, passed away on Tuesday, December 11, 2018 at her residence. Family and friends are invited to attend her visitation on Saturday, December 15, 2018 from 11 o'clock to 12 o'clock at White Oak Family Worship Center, 1944 Burney Rd. White Oak, NC 28399. A funeral service will begin at 12 o'clock. Burial will follow at White Oak Family Memorial Gardens. A memorial service will be held at Summerville Family Worship Center at a later date. Flowers will be accepted or memorials may be made to Summerville Family Worship Center, Missions Fund, 407 N. Magnolia St., Summerville, SC 29483. Marlene was born on May 16, 1921 in Woodbridge, PA, daughter of the late Leslie and Myrtle Tobin. She was a member of Summerville Family Worship Center. She enjoyed cooking, ministry work and sharing the Gospel. Survivors include: one daughter: Sheree S. Burney (Sam) of Summerville; two daughters-in-law: Edna Mae Sherrill of Hebron, MD and Dixie Sherrill of Salisbury, MD; seven grandchildren; twelve great grandchildren; several great great grandchildren and several nieces and nephews. She was predeceased by two sons: Russell V. Sherrill and Clayton C. Sherrill, Jr.; one granddaughter; one great grandson; two sisters: Darlene Bowen and Rev. Clara "Bonnie" Lesniak; and one brother: Rev. Clarence Russell Tobin. Services handled by James A Dyal Funeral Home and Bladen Gaskins Funeral Home.